It was difficult to decide which one to go for first, but I chose the Carpetbagger Journal because I loved the Bohemian feel of it and it includes softcover and hardcover versions. Nik explains everything so well and shows you all you need to know to create your own junk journals. Check out her YouTube channel for lots of ideas and free tutorials as well. One of the best things about this project is that I didn't have to buy anything at all - the whole thing was made from stuff I had already. It's a mixture of paper ephemera, scraps of fabric, family mementoes and various trinkets and knick-knacks I've been hoarding for years. Oh, and coffee-dyed papers - I spent a very happy afternoon dipping, cooking and ironing papers, can't believe I haven't tried it before. Thanks for visiting my blog today, hope to see you again soon! I just realised that I didn't post a pic of the cards I made in a last-minute flurry of activity to use up my Feb Counterfeit Kit which I called "Happy Hour". Cards are a great way to use up a lot of smaller scraps of paper and leftover embellies and it's always good to have a few ready in case you need one in a hurry (which I often do as I'm terrible at remembering dates). Thanks for popping in today, see you again soon!! Thing was, it was really difficult to know when it was in fact finished - just kept adding layer upon layer of paint, pens and pencils until it felt kinda done. I loved Marlene's idea of layering the ladies so that you could see one through and behind another, and it was a great exercise in playing with colours. I have no idea who these ladies are, but it feels like they're united in some way - maybe they're sisters, or friends, or layers of the same person .... hmmm .... what do you think? Lots of fun - check out the reveal over at the CSI blog for all the clues you need to solve this case. 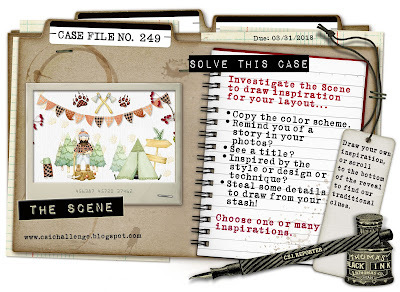 You can pick and choose which clues you follow or just pull your own ideas from the image to inspire you to dig into that stash and create a scrapbook page. I used all the colours in the Scheme, or as near as I could get to them, as well as several items from the Evidence list - owl, flowers, string, a knot, architectural elements (on the tag). The image inspired me to scrap this picture of a happy day out with John's grandchildren, Bailey and Macy, and the barrels behind us are echoed by this circles wood veneer piece which I really wanted to use. I coloured it with various shades of Distress Ink and added some gorgeous Embossing Enamel in Aged Teal from Stampendous - it has all these cool lumpy bits and a mix of teal and metallic colours, looks amazing IRL. The March Counterfeit Kit Challenge is a bit different from the usual, in that we are taking our inspiration from a kit put together by Susan, one of the CKC Design Team. 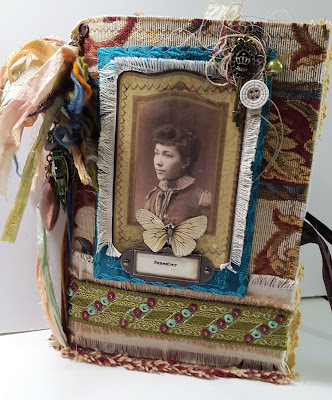 Susan was in turn inspired by this challenge on Jill Sprott's blog - check it out if you want to do some serious stash-busting. Susan followed Jill's formula to create her kit, which she called "Little Bits of Happy" - click on the link if you would like to have a look. She suggested starting with a multi-coloured patterned paper and taking your colour scheme from there, which is exactly what I did. We've just come home from a wonderful weekend at Regal Cottage in Wells-next.the-Sea, so my desk pic looks a bit different this week ..
You can see a pile of fabric pieces cut from old shirts, which I'm gradually turning into a quilt, using "Foundation by the Yard", along with the necessary bits and bobs, which all fit nicely into my gorgeous Jan bag which you can see on the left. On the right is a little treasure we found in a second-hand bookshop "The Girls Own Annual" which was published in 1883 and is full of beautiful illustrations, sheet music, fascinating articles and snippets of social history. Opposite me you can see my husband's Sudoku and tablet. Later, we were joined by Trina and Chris and a brilliant time was had by all. I was spoiled rotten with lovely pressies, we had some snowy seaside walks, fish and chips, a delicious Sunday lunch in the Golden Fleece and squeezed in quite a bit of trinket shopping (not like me at all, I blame Trina's influence!) as well as plenty of crafting and general lounging about. Ok enough waffle from me, time to link up over at Julia's Stamping Ground and see what everyone else is up to - you're welcome to join us and show the world What's On YOUR Workdesk Wednesday!! 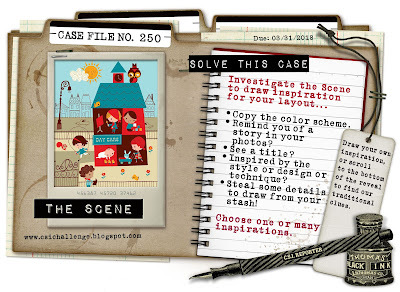 It's the 1st of March, time to reveal the new Case File #249 over at CSI: Color, Stories, Inspiration. You can draw your own inspiration from this image, or nip over to the CSI blog for a list of clues to follow. I loved the outdoorsy feel of the Case File and thought it would perfect for this photo of Yours Truly and my lovely stepdaughter Sarah, during a BBQ party in our garden last summer. The colours in the Scheme worked really well with this photo - I introduced some faded denim blue into the mix to pick up the colour in my shirt. Other clues I used were leaves, banner, plaid, triangles, woodgrain and branches. Why not have a go at this fun challenge yourself? There are fab prizes to win and loads of inspiration on the CSI Blog or check out the CSI Community Sharing FB page.